Last weekend our talanted karting driver Valters Zviedris fought last CIK-FIA Karting Academy stage, which took place from 1 - 4 September, in Sweden, on the Asum Ring track near Kristinstadt town. The last stage was placed high hopes as Valters knew the track and had already tested it. Zviedris showed a very successful qualifying journey, very good positions and pre-drives and pre-finals, but, unfortunately, before the finals - failed engine raffle and hope of being in the Top 10 became unrealistic. 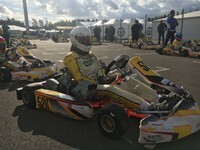 It is recalled that Zviedris is the only Latvian representative in the CIK-FIA Karting Academy. After the last stage Valters Zviedris father, manager and greatest support in competitions – Aigars Zviedris reveals: "In general, we are satisfied. Unfortunately, we did not meet the expected Top 5. We started as though encouraging, with qualifying 14th and 12th and 5th place qualifying at pre-drives. At one point, the second of which he had even 3rd place! Also in pre-final was passed very well and it gave Valters 11th place on the final drive starting line. Same finals unfortunately bad luck with an engine change, which changed with Luke Fungeling, rider from Germany. To rebut the failed engine change we took risk of tire pressure, but a little missunderstanding and got all 21 laps to fight for the retention of positions, instead of trying to actually fight for a higher place. Finish 18th in the finals was achieved. Also, our neighbors, bad luck - Kasparas Vaskelis which in Portugal ranked high 3rd place, now had was 19th position, while the estonian Siim Leedmaa suffered a serious accident in pre-final and finished in 25th place. " 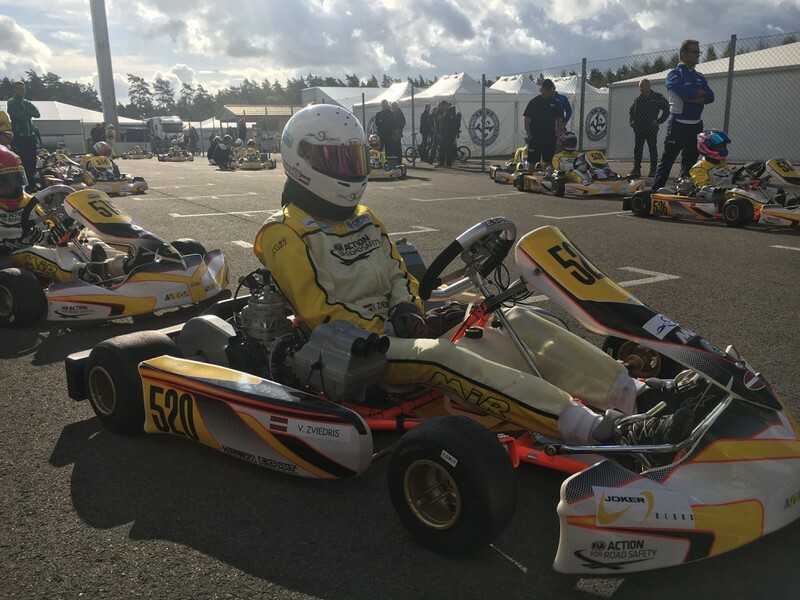 It is recalled that the CIK-FIA Karting Academy is unique in that all participants Karting Academy starts with one manufacturer's equipment - OTK Group Expirit Kart with Vortex OK Junior engine. Kartu frames participants drew all three phases, but engines - each stage separately. This means that competition in the fight for victory is made similar to the maximum, because the winner is determined only theoretical rider talent, team skills to regulate the technique according to the track characteristics and requirements of the athlete. But this time can not disagree with Aigars Zviedris that the engines draw in a sense, however, it is a big gamble: "The result shows that in pre-final Valters rate exiting the track of the line was 107.1 km / h and 112.5 km / h in turn the final drive only 106.1 km / h and 109.4 km / h, which is proof that this is not the pilot's fault but failed engine change. Competitors in the final drive speed tended to 111 km / h to 112 km / h, such as us in pre-final. " Valters himself with all trips, except the finals are satisfied, and argues that this was the same scenario like in the second phase during the Portimao track in Portugal, where the failure of the engine change does not fight for higher positions. "It would be with good, if pre-final would have been the final place and have reached at least the Top 12, but this time the bad luck. I’am glad for CIK-FIA Karting Academy experience gained, I have acquired a number of overtaking maneuvers and become more confident in their own abilities on the track. Many thanks to my dad for his work and support ", so Valters. Aigars Zviedris also adds: "It would be very helpful if a little more success. It was all trips except for the very last and most important, which is won places and points. In any case, Valters with his driving on pre-final showed that he can equally fight with the fastest Juniors from all over the world and 22 place overall from 51 participants are very well. I am proud of my son very much!" Valters Zviedris until now can boast of a two-fold Latvian Karting Champion 2009 Micro class and in 2015 Rotax Max Junior category. In addition to these titles Valters has a number of Latvian and Baltic championships medals, because every season spent in karting learned race victories and awards. Also, we are sincerely proud of Valters success and despite the fact that the place was probably not as high as hoped, we believe that this experience, which ge gained with participation CIK-FIA Karting Academy will be useful to him in the next races so he could bring Latvia’s name in the world sport arena! CIK-FIA Karting Academy standings table can be viewed here: http://www.cikfia.com/competitions/cik-calendar/2016/portimao/academy/championship-standings.html As well you can follow Valters Zviedris success in - www. prokart.lv website and Facebook accounts - Pro-Kart, Valters Zviedris Karting Pilot and Aigars Zviedris.